When mountain guide Micah Gallagher is hired by the spirited Hanna Alexander to help raise revenues for her failing family lodge, a high-country adventure filled with love, intrigue, and romance ensues. Almost immediately upon meeting the mysterious mountain guide Micah Gallagher, Hanna Alexander betrays her own professional ethics and finds herself enamored by the secretive and carefully guarded Micah. When the two unexpectedly fall in love, Micah is forced to face his past and the hidden places that haunt him-and Hanna must address her fears and determine if forgiveness can make way for love. Has fate brought the two together, or will circumstances tear them apart? What exactly are the secrets that Micah guards so closely? And will love and forgiveness prevail against the complications of their pasts so they can make way for a future together? Teeming with suspicion and intrigue, this Grand Teton adventure examines the struggle to forgive in the midst of conflicting emotional entanglements, fears of the heart, and the inevitable agony of love. 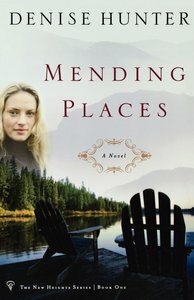 About "Mending Places (#01 in New Heights Series)"
Denise Hunter is the award-winning author of eight novels and three novellas including Surrender Bay: A Nantucket Love Story and The New Heights series. She and her husband helped start a new church two years ago that continues to reach the unchurched in their community. Denise serves on the worship team and leads Book Connection, a Christian fiction book club for women. She and her husband are raising three boys.